The influence of public carriers of goods, of which Pickford & Co. were the largest, resulted in their obtaining the rights of carriage and distribution of goods on the L&BR. Goods sheds had therefore to be provided for each individual carrier. 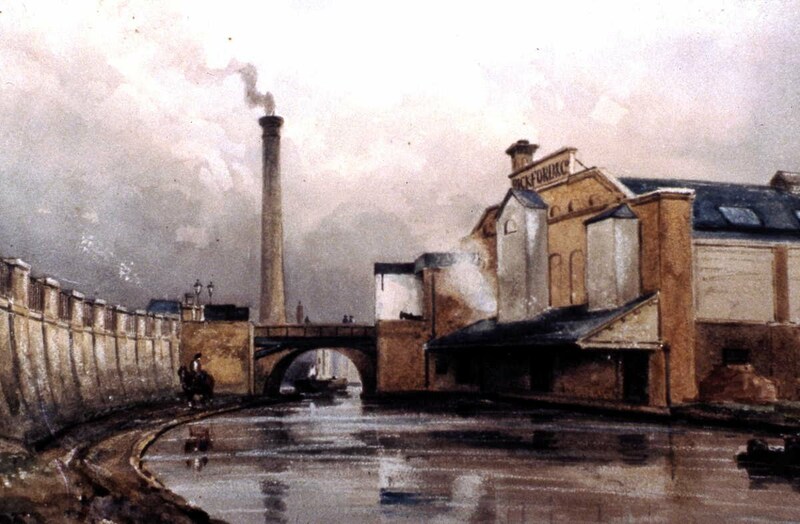 Pickfords, important carriers of goods by canal, had established their London headquarters at City Road Basin. The opening of the L&BR prompted them to start diverting some of their trade to the railway. This led to a major rift with Joseph Baxendale, a partner of the firm, who was also a director of the Regent’s Canal Company. The dispute was resolved when Baxendale in 1839 bought a plot of land on the south side of the Regent’s Canal at the top of Oval Road. He asked the noted builder William Cubitt (1791-1863) to create a special building which could transfer goods efficiently between road, water and rail. A large goods shed designed by Lewis Cubitt and constructed by W&L Cubitt was built at Pickfords' cost. A bridge over the canal on the west side of Southampton Bridge provided a rail connection with the goods depot on the north bank. The shed had extensive stabling in the basement at wharf level, vaulted with brick jack-arched iron beams. It opened in December 1841. The idea of connecting road, rail and canal traffic in one building appears to have been originated by Pickfords at Camden. The picture above of their shed on the Regent’s Canal shows the timber rail bridge alongside Southampton Bridge, the retaining wall along the towpath as far as Southampton Bridge, and the chimney of the coke ovens. The white building on the east side of Oval Road and on the south bank of the canal is Camden Flour Mills. It became Gilbeys' distillery some decades later. Pickfords greatly increased the size of their shed c1845, when a reduction in carriage rates caused a large increase in traffic volume. The enlarged shed is shown in the picture below, which shows the short-lived Camden Station passenger platform across the mainline to Euston from a south-westerly viewpoint (near where St Mark's Crescent now meets Gloucester Avenue). Beyond the four tracks is the ticket collectors’ platform and office and bankriders’ waiting room, built in 1846. To the right lies Collard & Collard’s piano factory. Pickfords' shed occupies the rest of the middle distance, its western façade stepped back twice from its frontage along the mainline. On the left of the picture a sailing barge is glimpsed on the canal, and part of the iron railway bridge over the canal appears. Another shed built in 1845 by L&BR for Chaplin & Horne, the second largest of the goods carriers, can be seen beyond the canal on the left of the picture. The goods carriage policy was reversed in 1846, when complaints about the carriers reaping all benefits from reduction in tolls obliged the rail company to purchase Pickfords’ shed and rent it back to Pickfords, as part of a new policy to carry out the rail carriage of goods through the railway company’s own agents. 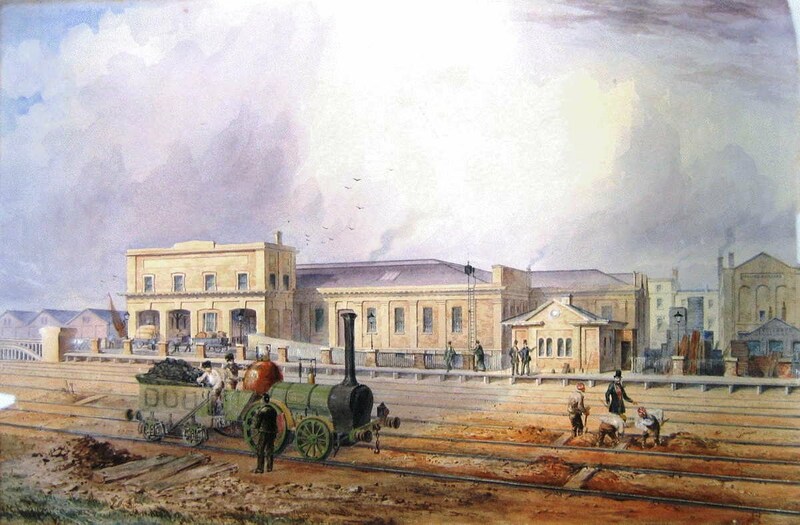 While Pickfords gave up long-distance canal carriage from the end of 1847 in favour of becoming an agent for the railways, they retained their City Road premises and although canal usage was greatly reduced they continued to handle some lightered goods between the docks, City Road and the Camden Depot. They rented the goods shed until 1857, when it was reconstructed following a major fire, after which time they shared it with Chaplin & Horne. A second fire in 1867 may have persuaded them to vacate it, after which it briefly became a potato market until in 1869 the LNWR persuaded Gilbeys to move their operations to the Goods Depot and take the shed on a 21 year lease. 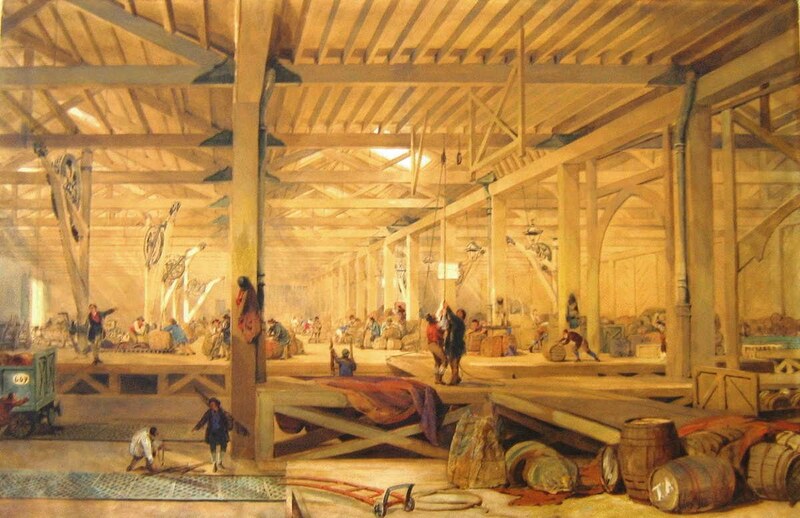 The interior of Pickfords shed in c1846 is shown below.